You know I will always love you (true BFF’s), but sometimes you really worry me. I consider myself to be an open-minded person so I have learned to accept things like macaroni and cheese pizza and chicken sandwiches made with two giant pieces of fried chicken where the bread should be. The beautiful thing about this land of the free and home of the brave is that the possibilities are endless. If you want to eat four fried cheese sticks inside of a grilled cheese sandwich, you can! Do you feel your lasagna doesn’t quite have enough carbohydrates and calories? 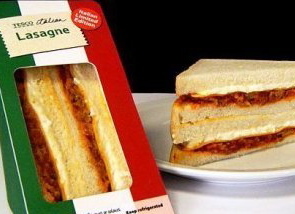 Stuff it between two pieces of enriched and fully processed white bread and go crazy! So you see? I can be on board with people eating 2,000 calorie sandwiches (as long as it’s not me or my loved ones) and can appreciate these anomalies for their sheer creativity. 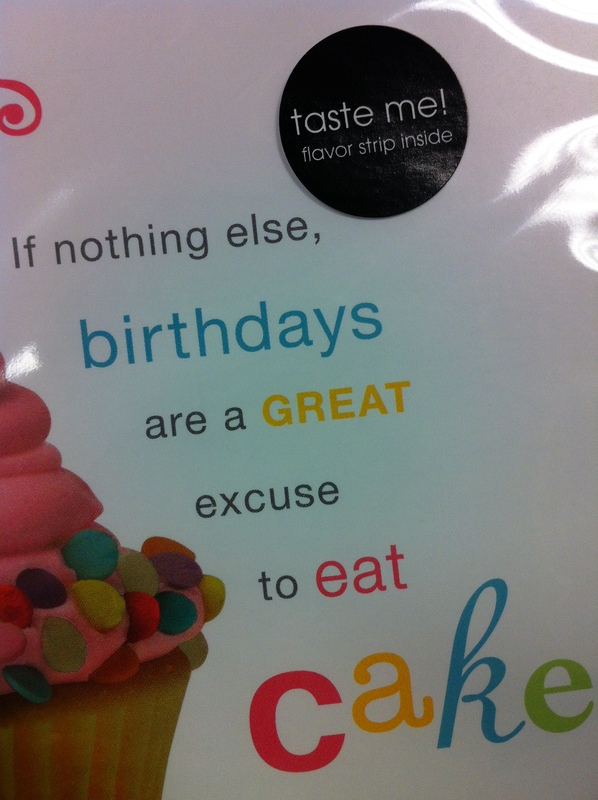 However cruising the card aisle of a drug store today, I came across something that stopped me in my tracks. 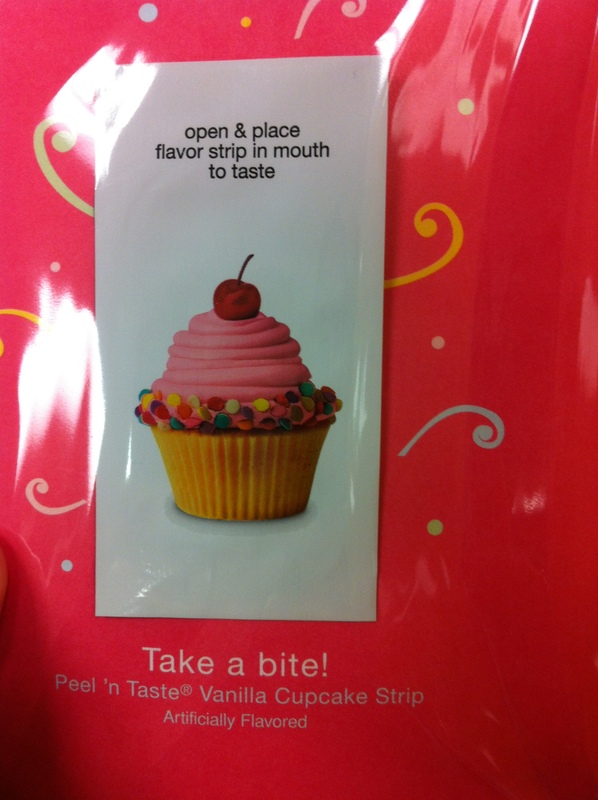 A birthday card that was partially edible. Really?? Are we so fat of a country that while opening cards and gifts we need to have a little bump to hold us over until the real cake is served? The only redeeming quality about this “flavor strip” is that it has zero calories, however that makes me even more suspicious. 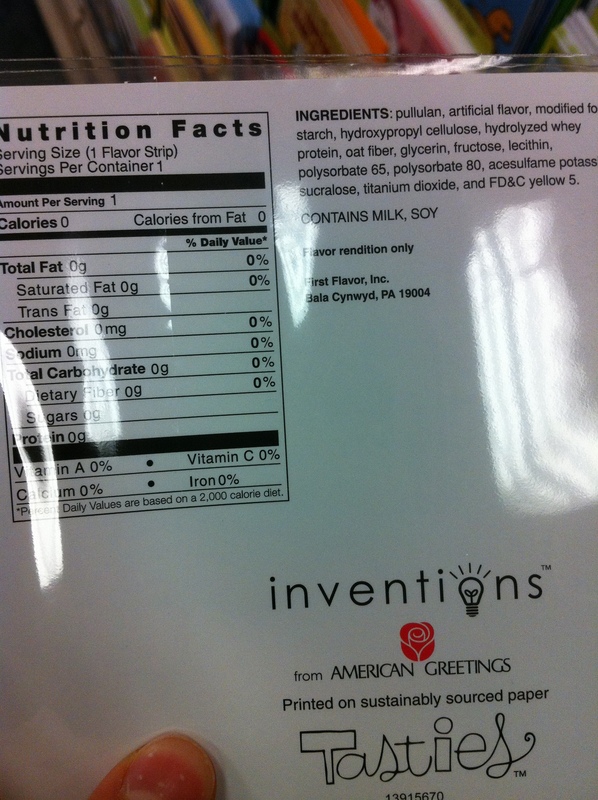 Maybe I’m crazy, but when our greeting cards suddenly require nutritional information and an ingredients list, I feel something is wrong. Why don’t we have these in Canada?! Haha I enjoyed this post, nice job. Hahahaha, I’m still freaked out about the fried cheese in the grilled cheese sand. Can you say disgusting? Give me some chocolate! Not some calorie free strip! Yeah makes you feel pretty good about yourself, eh? I suddenly feel so healthy just because I dot eat THAT bad of garbage haha!